Spain, 1997, 117 minutes, Colour. Eduardo Noriega, Penelope Cruz, Chete Lera, Fele Martinez, Najwa Nimri. 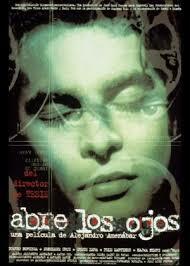 Abres Los Ojos was the second film of director Alejandro Amenabar who went on to make The Others with Nicole Kidman as well as The Sea Inside with Javier Bardem. This is a psychological thriller, reminiscent of such films as Seconds, combining reality and nightmare, relationships, physical accidents, psychology. It is also in the vein of Inception – though far less elaborate. It was remade by Cameron Crowe with Tom Cruise as Vanilla Sky, with Penelope Cruz in the same role as she performed in this film. The film focuses on Cesar, a dashing young Spanish man, who wakes from a dream, wakes again and finds that his life is entangled in dreams and reality. He is in a relationship with a woman who finally, in desperation, crashes her car to kill herself. He is disfigured in the accident and wears a mask. He has also taken up a relationship with the girlfriend of his best friend. She is played by Penelope Cruz. In his dreams/illusions/nightmares, he confuses the two women and their names. In this state of confusion, he finds himself being treated by a psychiatrist as well as being charged with the death of the woman driving the car. The psychiatrist tries to help him. A mysterious character from television also appears and raises the issue of virtual reality. By the end of the film, the audience will find it somewhat difficult to decide what is reality, what is dream, what is nightmare. The initial words of the film as well as the final words of the film are ‘Open your eyes’. 1. The impact of the film? Drama? Its acclaim? The American remake? 2. The work of the director, the cast and their careers? 3. A psychological drama, focusing on Cesar, his life, his dreams? His relationships, the two women, the accident, his disfigurement, the mask, the psychological treatment? The accusations of crime? 4. The nature of dreams, dreams within dreams? Their effect on the character? Nightmares and being trapped in the nightmare? The narration of the dreams? The psychologist and his treating Cesar? The role of the women in the dreams, his relationships, confusing their names, confusing their faces? The title to end the dreams? 5. The introduction to Cesar, waking for the day, driving, the empty city? Waking from the dream, Nuria with him, in the car, the crowded city? His work, his company, his partners – and the later paranoia about their trying to destroy him? His social life, with his friend, going to the party, discussing relationships, meeting Sofia, wanting to get rid of Nuria? 6. The night with Sofia? The drive with Nuria? Her suicidal attitudes? Crashing the car, the accident, his disfigurement? Wearing the mask? His lying on the floor, dealing with the psychologist? The questions of what was real and unreal? His masking himself? In reality or in the dream? The crime, the accusations? His imprisonment? 7. Sofia, her personality, with Pelayo? The meeting with Cesar? Their talking in the kitchen, the relationship? The growth of the relationship, her leaving with Cesar? Pelayo, his character, friendship with Cesar? His anger at Cesar and Sofia being together? 8. Nuria, the affair, Cesar and his casual attitudes towards her? Her dominating personality? At the party, her wanting him to dance? Cesar using Sofia to get away from Nuria? The escape? Her despair, the crash? 9. The dreams and the interchange between the dreams and reality? The TV personality, his presence, his identity? The raising of the issue of virtual reality? 10. The psychologist, the TV personality, appearance and disappearance? The psychologist, asking about the mask? The accident? In prison? His questioning his own reality and his place in Cesar’s dreams? 11. The audience, identifying with Cesar, his journey? The complexities? His interior life? The final words and the title of the film?